White on White aim is to investigate | criticize | affirm the identificatory process between WHITE audiences and WHITE performers on stage. White on White devotes itself with passion to the sight of the standard on European stages. In alternative to the concept of representation called multiculturalism, the series of the same name meets the question of appropriation/colonization of the so-called stranger with a radically discrete gesture: White on White devotes itself to WHITENESS. In 2009 Malmborg and Schmit launched their first duo work, White on White #1 – the rapyrus. The title refers to the script that was intended to become the script of the evening, consisting of quotes from 17 of their favorite afro-american Hip Hop songs. Malmborg and Schmit´s idea was that these lyrics would offer a subversive strategy to present the Other in the theatre space. Not by including it in an imaginary “we”, but rather to show the conflict between the included and the excluded within the space. 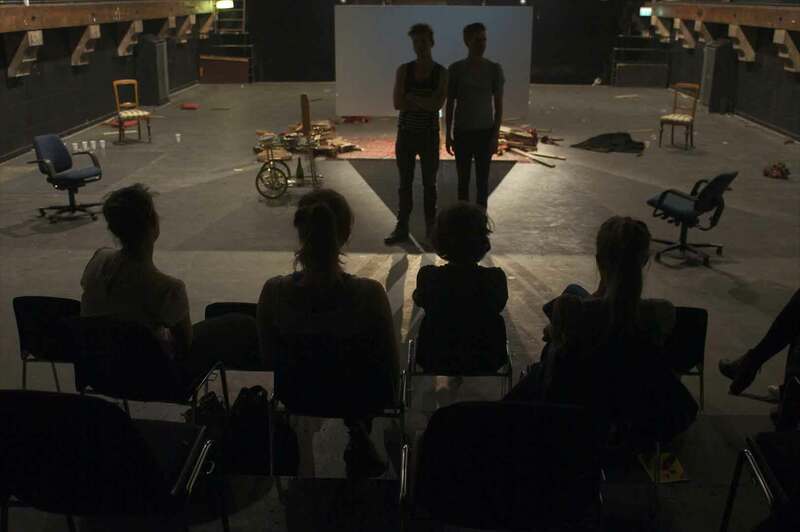 While working with the rapyrus, Malmborg and Schmit found that the subversive potentials of the text were somehow absorbed by the context in which it was supposed to be placed: the context of theatre. To work with the representation of the Other (in the case of White on White #1: the rap-lyrics) seemed to only result into a symbolic extension of the space. The dream scenario was of course that the lyrics would not only represent something unknown, exotic, but that their staging would also carry a threat against the entire context, which is necessary to create a radical change. The result was symbolic in the sense that it was obviously likeable; it would probably even lead to a feeling of catharsis, a feeling of that “we” together had done something good for integrating “the new”. 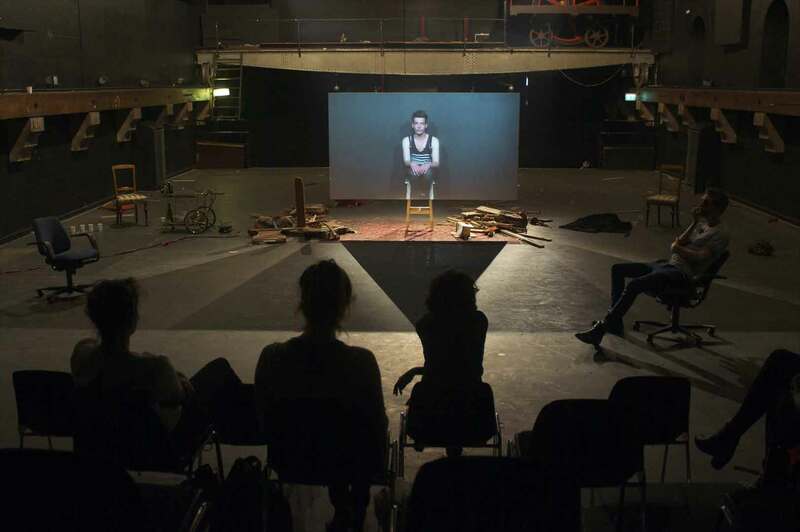 From there on going deeper into analyzing contemporary stage art and its strategies for participation, Malmborg and Schmit found out that the actual entry of the Other – even beyond representation – was meaningless as long as the institutional premisses remained unchanged. Facing this dilemma, they would from now on discuss the frame of the actual space and its politics, instead of trying to extend it by symbolic innovation. * Marking Whiteness as the hidden category dominating representation. * Questioning the notion of the new in arts as a gesture of subtle colonization. * Using ourselves in the style of a readymade, as the perfect representation of the WHITE perspective. * Working with the duo as a genre in itself. Why is the Black Box black? Why is the White Cube white? Or differently put: how would a theatre-institution look like, that is based on the so-called Critical Whiteness Theory? How a repertoire in Sweden, Europe? Differently put again: what has to be brought into our art spaces, so they become less WHITE. White on White, a new founded German-Swedish duo devotes itself with passion to the sight of the standard on European stages. In alternative to the concept of representation called multiculturalism, the series of the same name meets the question of appropriation/colonization of the so-called stranger with a radically discrete gesture: White on White devotes itself to WHITENESS. The reversal of the colonial gaze necessarily takes into focus those spaces of the art-world, that understand themselves being the ultimate spearhead of cultural amalgamation: in the logics of White on White though exactly these are considered to produce the very avant-garde of WHITENESS. The black box of postmodernist stage art – again and again it produces the WHITE Space: the one that gets access to it, turns into a shareholder of the WHITE Privilege, the one who learns its gestures may become the president of America, but he´ll rarely get to play Othello anyway. In White on White #3 Malmborg and Schmit take a closer look at the logics of innovation that structure contemporary stage art. What aesthetical strategy needs to be adopted in order to be perceived as THE NEW? What could be an authentically transgressive action within the frame of theatre and what kind of transgression can be considered “symbolic”, as it is complying with the economies of innovation that structure the art-world anyway? In more simple terms: is it an appropriate reaction to the segregated worlds dividing Malmö into WHITES and NON-WHITES to have an Arabic actor playing the main part in Hamlet and call the show Mohamlet? 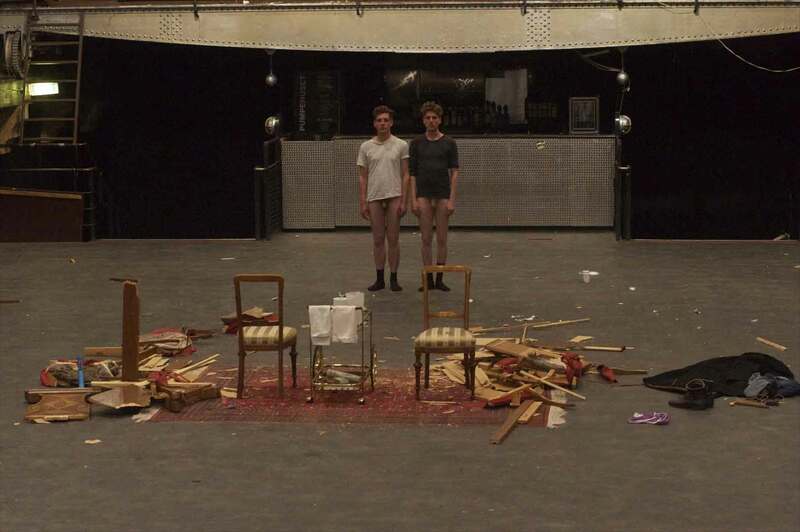 As a theatrical contribution to the multicultural dialogue between Sweden and Germany White on White #3 once again meets the challenge of giving the WHITE, European Majority-Society a voice / of taking the privilege of remaining silent away from it. FORGET INNER VALUES ! NOT EFFORT OR BEHAVIOR ARE THE GUARANTORS OF SOCIAL REWARD AND SUCCESS, BUT ONLY THE OUTER APPEARANCE! OR AS WHITE ON WHITEWOULD PUT IT – THE VISIBLE SURFACE. FOLLOWING THESE LOGICS, THE PERFORMANCE DUO SKETCHES THE VISION OF A UTOPIAN SURGICAL ART, THAT IS ABLE TO ERASE CULTURAL AND SOCIAL MARKS FROM OUR FACES WITHIN SECONDS, ACCORDING TO CONTEXT AND SITUATION – BUT WHILST OUR DIGITAL PROFILES SEEM TO COMPLY TO BODY MODIFICATIONS IN ONE CLICK, THE HUMAN FACE STILL PROVES TO BE A SOLID AND DIFFICULT, SOMETIMES BLOODY UNIT. In this framework, ALL THOSE BEAUTIFUL BOYZ attempts to analyze how european racist concepts have dissolved into contemporary concepts of beauty and are since being violently applied in “all-white”, socially segregated settings, such as for instance the cultural field in sweden or germany. In order to so, WHITE ON WHITE sensualizes the relation between seeing and desiring: offering the duo’s bodies – the bodies of european cultural workers – as visible proof of an obvious, unconscious strive for Whiteness. Crossing discursive and choreographical techniques, ALL THOSE BEAUTIFUL BOYZ works foremost with “projections”, in the very concrete as well as the very abstract sense of the word. With optical illusions and some sweet video stunts, with charme and finesse. WHITE ON WHITE puts up the simple question: in how far the screen in the center of the stage does display all essential information of a subject projected? and in how far the body of the performer on stage is ever more than its own virtual image?